Dabbing away tears as his daughter Chelsea Bynum-Grant spoke, Dr. William B. Bynum Jr. was celebrated as a father, friend and mentor at his formal installation ceremony at Jackson State University on Thursday, Oct. 11, 2018, inside the Rose E. McCoy Auditorium. “My family and I have had the unique pleasure of witnessing the evolution of Stone,” said Grant calling her dad by an intimate nickname shared among those in his circle. In a tongue-in-cheek manner, she then went on to describe her father’s various endearing attributes like his all-white linen outfit, Charlie Sheen-ugly shirts that he refuses to throw out, Jesus cook-out sandals; a Rick Ross music phase, never-ending love for Sweet Baby Ray’s barbecue and his epic screaming ‘Yeah, baby’ whenever Duke is playing the Tar Heels. Grant’s loving description drew laughter from the audience but also illustrated a down-to-earth and humble side of the self-proclaimed “God-loving, God-fearing, blessed and highly favored” 11th president of Jackson State University. “He has always put family first, and he makes it his duty, amongst many other things, to make sure that he makes memories that last a lifetime,” said Grant. She then added that her father has never forgotten where he comes from and always gives the 252 a shout out, referencing the area code of Rocky Mount, North Carolina their hometown. Giving a testament to Bynum’s mentorship was Ricky D. Robinson, who met the president during his stint at Clark Atlanta University. Now co-owner of Alln1 Security Services, Robinson said, “Dr. William B. Bynum is not the president of Jackson State University by default. He is the president of Jackson State University by God’s design.” Janet Stovall, manager of executive communications for UPS, has been friends with the president for nearly 40 years with a history stemming back to his days as a student-athlete. She characterized the president as a trailblazer. 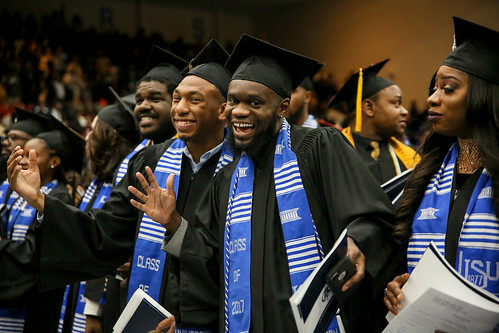 Jackson State University will provide nearly $305,000 in student scholarships thanks to donors who supported President William B. Bynum Jr.’s Inauguration Celebration Dinner that featured renowned gospel artist Marvin Sapp. Bynum graciously accepted the check presented by inaugural chair Veronica Cohen, vice president of Institutional Advancement and External Affairs. The president also offered gratitude to dozens of donors, saying, “Because of your support we’re going to be able to change a lot of lives at Jackson State.” Bynum illustrated the importance of their benevolence. ‘FOR most of our students, the difference between being enrolled and not enrolled is usually only about $500 to $1,000. … To a lot of our families that might as well be $10,000 or $15,000 because it’s that impossible,” he said. President Bynum and First Lady Bynum pictured with luncheon guests. A sold-out audience, with a vested interest in the academic success of Jackson State students, joined the first lady of JSU, Deborah E. Bynum, for her inaugural scholarship luncheon at the Mississippi Civil Rights Museum last October. The luncheon’s purpose was to assist with alleviating some of the financial burdens students face during their tenure at JSU. “As first lady of JSU, it is important for me to help provide gap funding for our students. My goal for the proceeds from this luncheon is to establish merit and need-based scholarships and an endowment for our students,” Bynum said.